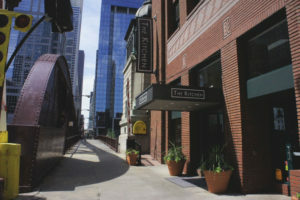 The Kitchen was founded in Boulder, Colorado in 2004 and features delicious food with a strong focus on local and sustainable sourcing at its restaurants in Colorado, Chicago and Los Angeles, with expansion to Memphis under way. And The Kitchen, founded by entrepreneur Kimbal Musk and his partners Hugo Matheson and Jen Lewin, goes beyond the core Good Food principles with its strong social mission. The Kitchen Community, a 501(c)(3) nonprofit adjunct to the restaurant group, has since 2011 built learning gardens at schools in the cities where it has operations. With a goal “to connect kids with Real Food,” The Kitchen Community has created more than 200 school gardens over the past five years. 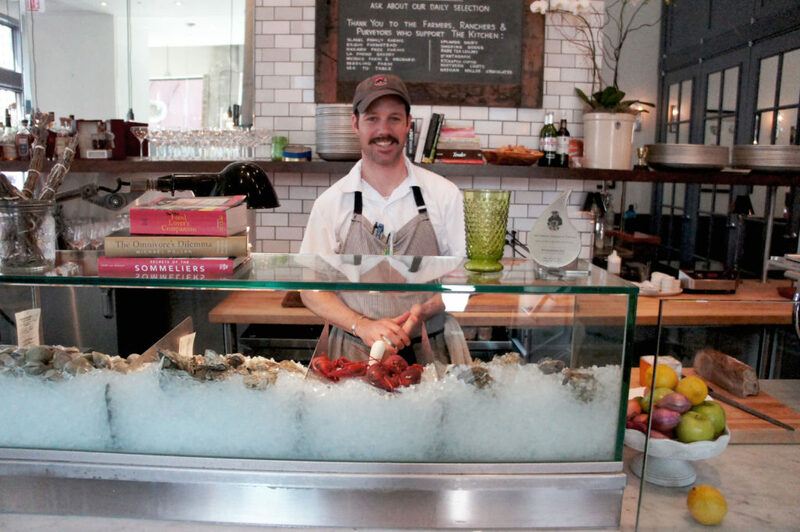 Johnny Anderes is head chef of The Kitchen Chicago, with a beautiful location on the north bank of the Chicago River. A native of Minneapolis, Anderes says his interest in cooking was inspired by his food-centric family. And after he moved to Chicago in 2004, the die was cast for him to pursue a career cooking with locally and sustainably produced ingredients: He worked for six years at Avec, one of the restaurants created by Chef Paul Kahan — a sustainability leader in Chicago’s culinary community — and his partners at the One Off Hospitality Group. Anderes proceeded to open two restaurants in the Logan Square neighborhood — Reno, a casual eatery featuring wood-baked pizza and bagels, and Telegraph, a biodynamic wine bar that is now closed — before taking a break to tour his wife’s home state of New York. It was during that break that Musk contacted him to see if he would be interested in heading The Kitchen at its new Chicago location. Anderes promptly agreed to take the job, and has been at it since 2014. The Kitchen Chicago is located just a few blocks from FamilyFarmed’s offices, so I visited with Anderes to discuss the benefits and challenges of farm to table dining. The interview is excepted below. 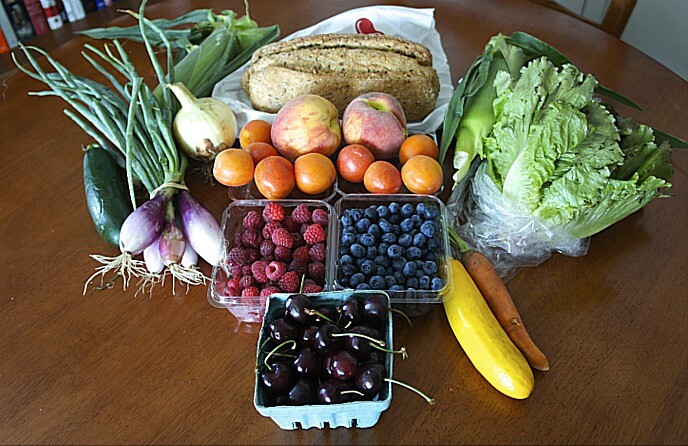 FamilyFarmed (FF): When you started out, say 15 years ago, what was sourcing like? Anderes: You had to kind of go out and do it on your own. That was part of the fun, part of the draw for me was the adventure of seeking out who is growing the best apples, who is growing the best corn. It became more of like a scavenger hunt, a treasure hunt, but for something edible. It’s different now because I feel like a lot of that is brought to you, through Local Foods, even every broadline distributor carries farmer produce, fish and poultry and meat. It’s at your fingertips now…. Probably the biggest thing that it’s done is that 15, 20 years ago there were a few pioneering farmers who were growing specialty crops and were catering to the Chicago market. But now there’s a growing number… You have more access to more different kinds of products and your relationships with farmers and even the wholesalers who provide you with your food and send that message down the line. Anderes: What I’ve been doing for the past couple of years is going to the farmers and saying, ‘What do you need from me?’ We go through so much product… We have pork tenderloin on the menu. It’s not especially in vogue, which for us creates a really good price, because the farmers are, “I have 1,000 pounds of pork tenderloin in my freezer.” And I can commit to 1,000 pounds and go through it in two months. I get a great price on it and they get rid of their not-so-in vogue cuts. FF: There are some issues you have to deal with as a chef. For instance, some of the qualifiers, such as local. We’re sitting next to The Kitchen Chicago’s seafood bar [lobsters, oysters, clams], so obviously that’s not local. Anderes: I think that Good Food, like this raw bar, comes from relationships. I have one woman who picks out all of our mussels and all of our halibut, clams in one part of Maine, and then it’s just shipped right over. A lot of what we do is relationship-driven, and that’s part of our ethos…. Obviously we can’t get a lot of local seafood. Some whitefish, and we try to keep all of our local within 350 miles. FF: About seasonality. You have a sophisticated customer base. Do they comprehend that it’s going to be hard to get a lot of things on the menu, or do they just expect that you’re going to have some things year-round? Anderes: I think the expectations here at least are that we’re going to make the right decisions with purchasing… We do cater to that hyper-foodie as well, especially when you dig kind of deep into our purchasing and what we’re actually trying to accomplish, which is what I get excited about. Your average customer might not get excited about committing to buy 10,000 pounds of Sockeye salmon from Bristol Bay, Alaska, but I’m excited about that. FF: I saw a quote from you in Chicago magazine less than two years ago and you said you weren’t going to do the “easy farm to table.” A lot of places still are finding it challenging. How far have you gotten in achieving that, or is there an easy farm to table? Anderes: I think it’s easier now… I feel like we’re getting to the point now in most cities, where you go to a restaurant and that should just be standard, especially in a city like Chicago or New York, even in smaller cities like Minneapolis, Pittsburgh, it should be kind of expected. FF: That’s the point of this whole series that we’re doing because the restaurants that were called out by the Tampa Bay Times [in an article about restaurants in its area titled “Farm to Fable.”], they’re not necessarily selling bad food, but they’re not doing what they say they’re doing. So it’s about transparency more than anything else. Anderes: Not everything we did is organic or local. There’s not a restaurant that’s doing over $1 million or $2 million that can say that 100 percent of what they bringing in is organic. We shoot for a high number obviously, and I feel like we’re about 90 percent. FF: Let’s talk a little about The Kitchen’s broader social mission, the Kitchen Community and the concept of food education. Anderes: I just came from a Kitchen Community planting at Pierce School in Edgewater [a Chicago neighborhood]. The Kitchen Community is in almost 200 public schools, managing gardens, getting with the teachers and building community around the kids and teachers to essentially teach how to garden at home, small-scale farming. We do an entrepreneurship program, where we’re hand-selecting some of these high school kids to come work for us, and we’re buying vegetables back from the schools. They learn the business side too. FF: We were talking about seasonality. Tell us about your spring menu and how it’s changed. Anderes: It’s a lot of spring vegetables, carrots, spinach. We added a side section to our menu. Beet tops, going through your hardier greens, just sautéed on the side, and keeping that super-seasonal, really simple. We have a lot of different mouths to feed. You have to be creative with your sourcing and even restaurant management kind of comes in. 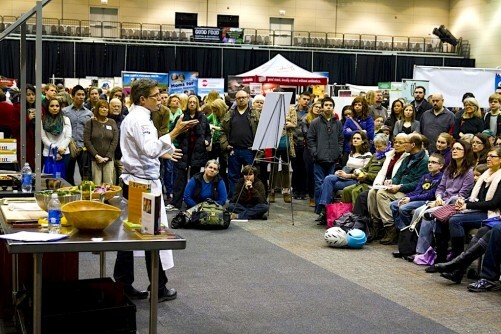 This article is part of FamilyFarmed’s new Farm to Table: Keeping It Real series. If you are a chef or restaurant who would like to tell your businesses farm to table story, or if you have a chef or restaurant you would like to recommend, please use the comments section on this article. This entry was posted in Child nutrition and health, Farm to table dining, Farm to Table: Keeping It Real, Food education, Food Entrepreneurs, Good Food Dining, Good Food restaurant trends, Healthy eating, Healthy eating for children, Restaurants and Good Food, School food, School gardens, Sustainable food education and tagged Farm to Table, Farm to Table: Keeping It Real, Food education, Johnny Anderes, Kimbal Musk, local sourcing, school gardens, sustainable sourcing, The Kitchen, The Kitchen Chicago, The Kitchen Community. Bookmark the permalink.